WAGs - Wrist Assured Gloves. 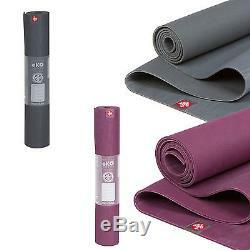 Manduka eKO 79 Inch Long Eco Friendly Fitness Exercise Non-Slip Yoga Mat 5mm. The eKO Mat is new and improved, and now offers an unparalleled grip to perform even in the sweatiest of conditions. This eco-friendly yoga mat made from biodegradable, non-Amazon harvested, natural tree rubber provides cushion and support for your practice while protecting the planet. Manduka's renowned eKO mat is new and improved, and now offers an unparalleled grip to perform even in the sweatiest of conditions. In addition to its superior grip, the mat provides exceptional comfort and performance. The eKO mat is eco-friendly and made from biodegradable, non-Amazon harvested, and natural tree rubber that cushion and supports your body while protecting the planet. The new rippled water top surface features an innovative, sealed-cell natural rubber surface that creates a hygienic barrier and excellent loft and recovery. These natural rubber mats use a toxic-free softening process and are completely free of toxic foaming agents and plasticizers found in other mats. The eKO represents a bright future for the eco-friendly yoga mat - it leaves behind no footprint in landfills, but will definitely make a lasting impression in the studio. Discolouration can be a by-product of natural rubber products. 3.6kg; 200cm long x 66cm wide x 5mm thick. Offers unparalleled wet grip to perform even in the sweatiest of conditions. Most durable natural rubber yoga mat on the market. Made from biodegradable, non-Amazon harvested, natural tree rubber. Developed over 4 years by yoga teachers. Designed to provide the ultimate combination of cushion and grip. An eco-yoga mat with no PVC or toxic plasticisers. 99% latex free, and safe to use for most people with latex sensitivities. All post-industrial scrap is thoughtfully collected and utilized in the production of other materials creating a zero waste manufacturing process. Tri Layer Technology for optimal combination of grip, durability and slip-resistance. To Clean: We recommend using Manduka Mat Restore or a diluted organic cider vinegar wash (50/50) and a damp cloth or sponge. It is recommended that you DO NOT put the eKO Mat in the washing machine, as it will encourage the material to break down (biodegrade). To Store: Do not leave the mat exposed to excessive amounts of sunlight. If wet, allow the mat to dry before rolling up. Through Manduka's manufacturing process, the eKO Series mats are 99% latex free, and safe to use for people with latex sensitivities. The eKO Mat is made from sustainably harvested tree rubber. Unlike other rubber mats available today, the foaming agents used to create the eKO are non-toxic. What this means is that no toxic chemicals have gone into the manufacturing process to soften rubber; when the eKO mat is disposed of and biodegrades, it will not leave behind a toxic residue. Additionally, instead of using synthetic polyester for reinforcement, we have chosen to use a blend of polyester and natural cotton. Add to your Watch List. We Love Yoga and Fitness! Yoga Studio is a family business. Yoga Studio has been around since 2003. At Yoga Studio, our aims are Simple: 1. We will beat any like for like quote. "Can do attitude" - "You want it - you got it" 3. Mix & Match wholesale - no MOQ on wholesale. If you want you logo or picture on yoga equipment we can help. With embroidery, screen printing, heat press transfer or digital printing we offer the most comprehensive range of personalisation options for you, your business or just to make a fun present. Custom Print: Yoga Studio offer custom/personalise Logos and Designs for clients. Your logo on Yoga Mats, Your Design on Yoga Mats. Ethical values are very important to Yoga Studio. You will see in the FAQ's section that we don't just repeat what the manufactures say about their products. We give you our opinion as well, letting you make an informed decision. We don't sell what we consider unethical products. Take the ecoYoga mat for example - made in the UK from latex and jute. This is the truly only eco-Yoga mat made from latex that is offered for sale in the UK. There are several other brands and companies that offer a "similar" Chinese eco mats and pass them off as "eco-mats" - but they are not. They totally contradict what an eco-yoga mat should be, with the chemicals embedded in the material, the manufacturing standards and the pollution casued. Be assured that we will always stock quality items that are sourced responsibly. We work with our suppliers to ensure the health and happiness of their employees. Sustainable materials are used as far as possible and we are trading ethically. Yoga Studio strive to be the Most transparent, honest, unbiased Yoga and Fitness equipment retailer and wholesaler Worldwide! We look forward to providing you with the service you deserve. We are always here for advice, a chat, or just to say hello! We offer Wholesale for all teachers/instructors. However if you`re not in don't worry they will put a card through your door with instructions on how to get your parcel. All international orders are sent using a Parcel Force internationalsigned for service. We know how important it is to feel protected and secure when shopping online. That's why we go out of our way to make sure that's how you feel when shopping with us every time. No Quibbles Guarantee: We want you to be delighted every time you shop with us, however we appreciate that occasionally your items may arrive and not be quite what you hand in mind. We are proud that our No Quibbles guarantee gives you more than your statutory rights, so we ask that you use this policy fairly. If you wish to return your item please get in contact with us at. Mix & Match wholesale - low MOQ on wholesale. You may Also Like this! The item "Manduka eKO 79 Inch Long Eco Friendly Fitness Exercise Non-Slip Yoga Mat 5mm" is in sale since Tuesday, September 27, 2016. This item is in the category "Sporting Goods\Fitness, Running & Yoga\Yoga & Pilates Equipment\Mats & Non-Slip Towels". The seller is "yogastudiouk" and is located in Dorset. This item can be shipped worldwide.